Junior’s Smokehouse Processing Plant in El Campo, Texas is recalling about 690 pounds of ready-to-eat Buc-EE’s beef jerky, more specifically, teriyaki beef jerky products because they may be contaminated with foreign materials, according to the USDA’s Food Safety and Inspection Service (FSIS). More specifically, there may be pieces of hard metal in the product. This could pose a choking hazard or cause injury. No illnesses or injuries or other adverse reactions have been reported to date in connection with this issue. These items were produced on August 9, 2018. 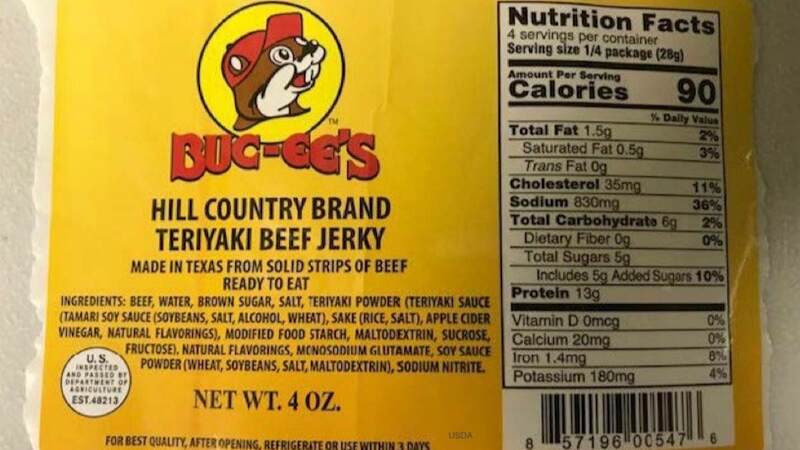 The recalled product is 4 ounce plastic pouches of “Buc-EE’s Hill country Brand Teriyaki Beef Jerky, Made in Texas From Solid Strips of Beef, Ready to Eat.” The best by date is 08-09-2019 and the lot code is 220-272. This product has the establishment number “EST. 48213” inside the USDA mark of inspection. The Buc-EE’s beef jerky was shipped to retail locations in Texas. The problem was discovered when a customer said they found metal in the teriyaki beef jerky product. If you bought this product, do not eat it. Throw it away after wrapping it securely or putting it into another container. You can also take it back to the store where you purchased it for a refund. Anyone who concerned about an injury should contact a healthcare provider. FSIS is conducting retail effectiveness checks to verify that the company is notifying customers about this recall. They also want to make sure that this product is no longer available to consumers. This is a Class II recall, with a low health risk to consumers.